If ever a marketer needed a good story it would be Smart. They are afraid to even try to market their truly unique and original vehicles in America. They aren't willing to craft a new story for cars in America. The story so far is one of despair and fear. DaimlerChrysler is either saber rattling to build buzz(unlikely) or they simply don't have the marketing vision to see what is possible in America with the Smart line of tiny cars. 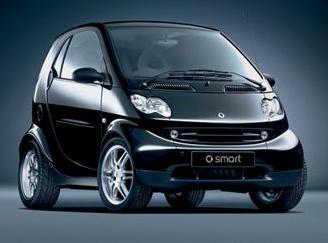 Smart has the potential to be the iPod of cars. Huge sales are possible if the marketing is handled masterfully. Markets abound for these tiny cars. Urban Dwellers, Teens, Tuners, Geeks, Long distance commuters, Promotional vehicles, Fleets, Car sharing networks, Tree Huggers, etc. Wise partnerships with dealer networks and experiments could drive sales. Can you imagine Smart's glass cylinder vending machine towers outside Target stores? How about buy one get one free offers from Mercedes? There are lots of possibilities. Apparently vision lacks with Smart. In what amounts to a near "kiss of death," DaimlerChrysler CEO Juergen Schrempp told analysts that the Smart minicar brand "could be expunged." The remark, made before a small group of analysts in Munich, Germany, and reported by Automotive News Europe, all but refutes pro-Smart continuity statements by Smart CEO Ulrich Walker and Mercedes-Benz car group CEO Eckhard Cordes. "We are known for unpopular decisions," Schrempp told analysts, adding that no certain forward course lies ahead for the mini-compact brand. Smart has gone on sale in Canada, but its U.S. launch of a newly developed ForMore SUV has been delayed beyond a September, 2006 target date. In the U.S. , nearly 80 Mercedes dealers have signed up for the Smart franchise. Smart's mini-compact models which launched the brand in 1998, the fortwo and forfour, are not deemed large enough for U.S. tastes, as contrasted with the larger formore. Schrempp said a decision on Smart's future will be disclosed by the end of April. It all depends on the story that Smart crafts to tell customers and prospects. Paging Seth Godin. Check out my Edge Thinking About Smart Cars. I have owned and leased Mercedes Benz automobiles for over 12 years. I would like to send a letter to the CEO of Mercedes Benz that, I believe, will shed some light as to why Mercedes Auto sales have dropped. Please email me his name and address. Please send name and address of C.E.O. I would like to know the contack info. for the Canada dealers that sell the "Smart Car"